In a recent interview, Pricilla Shirer said, “Prayer is the most powerful weapon the church has to unlock the activity of heaven on earth.” Yes. prayer works! Faith-filled prayers get results in due season. The Word of God states that the “prayers of righteous persons are powerful and effective”. James 5:16. Prayer moves the hands that move the universe. Prayer invites God to glorify Himself in our needs and weakness. God can do great things in the nation, community and in your life. God can restore that which was broken or torn down. He redeems those who were lost and can turn situations and circumstances around. The National Day Prayer that Pastor Andre Butler is discussing emphasizes prayer for America and its leadership in the seven centers of power: Government, Military, Media, Business, Education, Church and Family (I Timothy 2:1-6). The sovereign Lord listens to our cries, waits to intervene on our behalf and to deliver and transform the ills of our nation. (See e.g. Zephaniah 3:17). Prayer is required and imperative for believers individually, and corporately, to pray continually throughout the year, not just on the National Day of Prayer. Believe in prayer. It is the best way we have to draw strength from heaven. What do you believe God for today? Meditate on the Word. Pray. Listen. Believe. Pray. Believe. Hear. Do. Article by Linda Fegins, The Prayer Leader, May 11, 2016, ldfaygo@gmail.com .Linda is a Intercessory Prayer Leader at Messiah Baptist Church and a intercessor, prayer teacher and trainer of a global prayer ministry. Video is by -Pastor Andre Butler who is the executive pastor of Word of Faith International Christian Center, founded by Bishop Keith A. Butler, in Southfield, Michigan and the former pastor of Faith Christian Center in Smyrna, Georgia. His mission in life is to equip others to experience the future that God has for them. His ministry emphasizes God’s desire to prosper His people in every arena of life and God’s command for His people to do their part in winning the world to Jesus. Wake Up America! Pray ! Wake Up America! Pray ! So much is going on in our nation –racism, attack on God’s Word and Way, personal and corporate financial distress, hatred, violence, leadership failures, ISIS, war , human trafficking and more. True, the world will not get any better unless we, you and me, pray and cry out to the Lord in fervent prayer, with a repentant heart, to heal the land. Once we soak in prayer, get our instructions from the Lord, then we must also “Do”— take action to make a difference. Let’s join in corporate prayer on May 5th, 2016, which is National Day of Prayer throughout the day and pray from where ever you are—home, work, school etc. 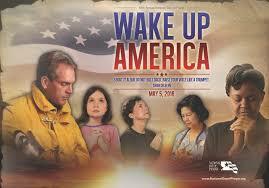 This year’s 2016 theme: Wake Up America. Scripture: Isaiah 58:1a “Shout it aloud, do not hold back. Raise your voice like a trumpet” The national theme, Wake Up America, emphasizes the need for individuals, corporately and individually, to return to the God of Fathers in reverence for His Holy Name. Join with the nation of Believers to emphasize prayer for America and its leadership in the seven centers of power: Government, Military, Media, Business, Education, Church and Family. For the May 5th observances, Dr. Tony Evans, is the 2016 Honorary Chairman. Millions of people will gather to pray at thousands of events around the nation. Gather your friends and family members together in prayer. We have an opportunity to see the Lord’s healing and renewing power made manifest as we call on YOU and all citizens to humbly come before His throne. The apostle Paul urged that “requests, prayers, intercession and thanksgiving be made for everyone…that we may live peaceful and quiet lives in all godliness and holiness. (I Timothy 2:1-3). It is time for us to pray as a nation corporately and individually. In this turbulent time of open racism, rumors of wars and aggression, and troubled communities and cites we need to go before the Lord to seek through prayer, “peaceful and quiet lives” – for ourselves, our families, our neighbors and friends and our nation. For the May 5th observances, Dr. Tony Evans, the 2016 Honorary Chairman, wrote a special prayer to be simultaneously read throughout the nation at noon (ET). This recitation will create a huge wave of prayer, flowing from one coast to the other, illustrating the unity of God’s people and acknowledging His dominion over the circumstances facing us. “At this crucial time for our nation, we can do nothing more important than pray”, states Dr. Evans. Make this spiritual discipline a personal priority and take a stand with myself and others as we encourage others to incorporate prayer in their lives.